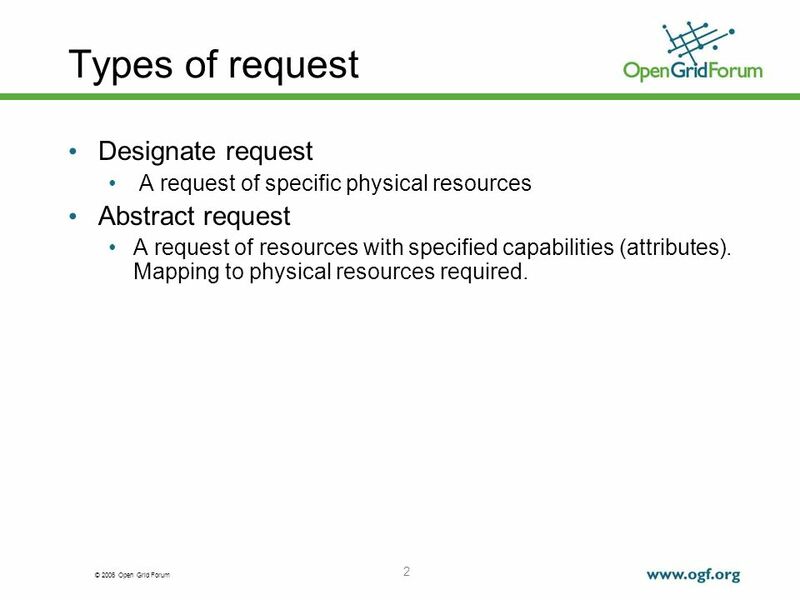 2 © 2006 Open Grid Forum 2 Types of request Designate request A request of specific physical resources Abstract request A request of resources with specified capabilities (attributes). Mapping to physical resources required. 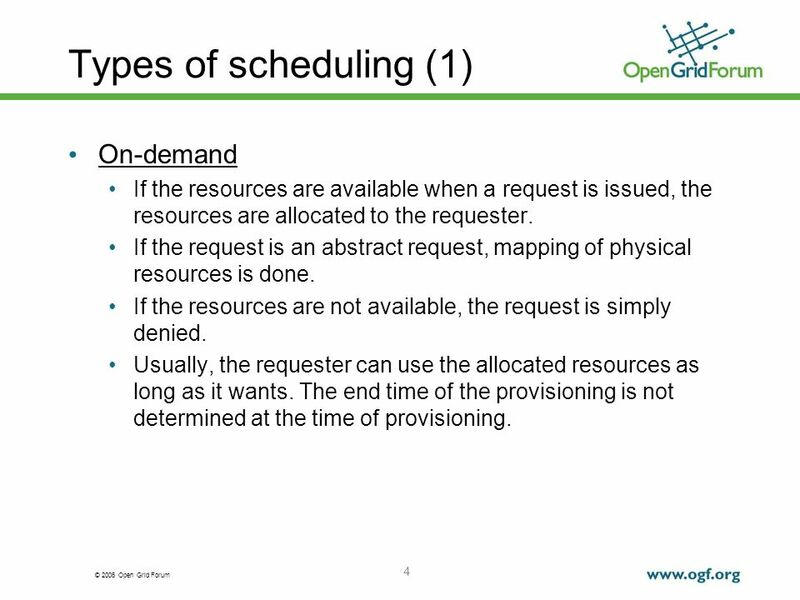 4 © 2006 Open Grid Forum 4 Types of scheduling (1) On-demand If the resources are available when a request is issued, the resources are allocated to the requester. If the request is an abstract request, mapping of physical resources is done. If the resources are not available, the request is simply denied. Usually, the requester can use the allocated resources as long as it wants. The end time of the provisioning is not determined at the time of provisioning. 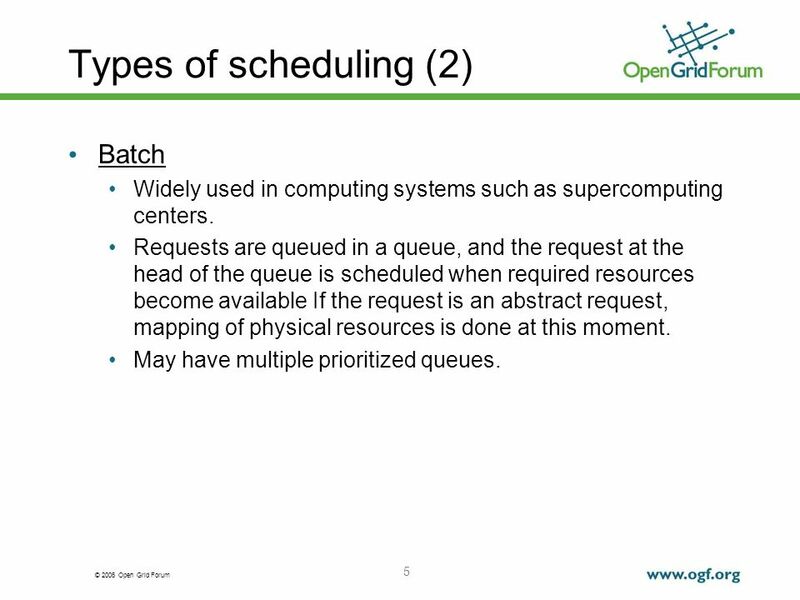 5 © 2006 Open Grid Forum 5 Types of scheduling (2) Batch Widely used in computing systems such as supercomputing centers. Requests are queued in a queue, and the request at the head of the queue is scheduled when required resources become available If the request is an abstract request, mapping of physical resources is done at this moment. May have multiple prioritized queues. 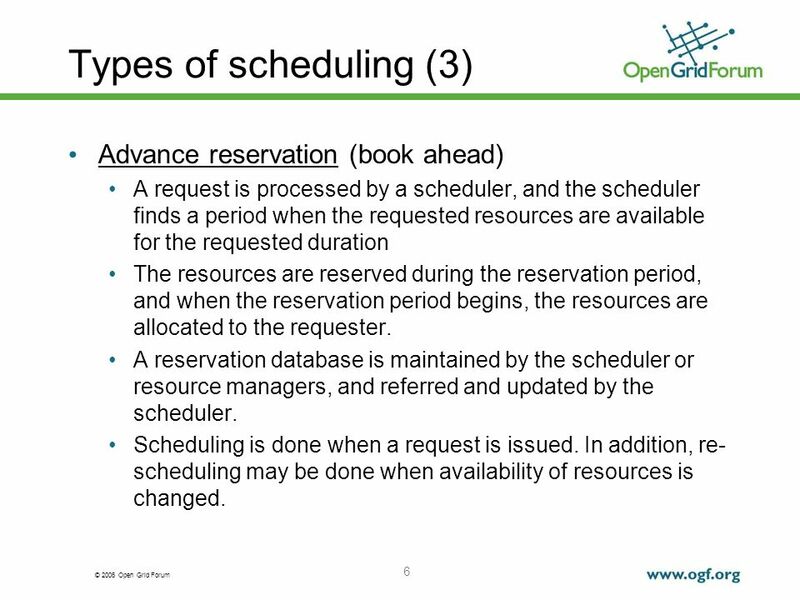 6 © 2006 Open Grid Forum 6 Types of scheduling (3) Advance reservation (book ahead) A request is processed by a scheduler, and the scheduler finds a period when the requested resources are available for the requested duration The resources are reserved during the reservation period, and when the reservation period begins, the resources are allocated to the requester. A reservation database is maintained by the scheduler or resource managers, and referred and updated by the scheduler. Scheduling is done when a request is issued. In addition, re- scheduling may be done when availability of resources is changed. 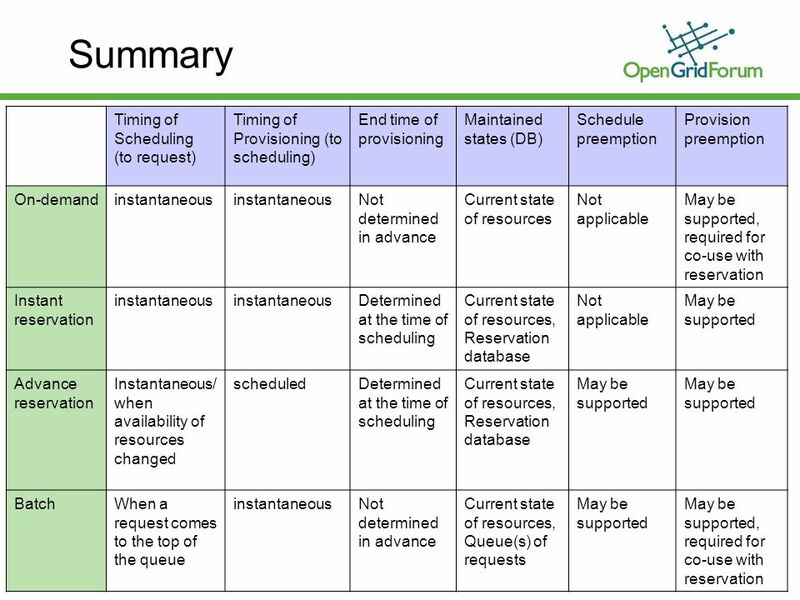 7 © 2006 Open Grid Forum 7 Types of scheduling (3) Instant reservation If an advance reservation request requests immediate allocation of resources, the request is called instant reservation. Different from the pure on-demand the end time of a provisioning is determined at the time of scheduling. 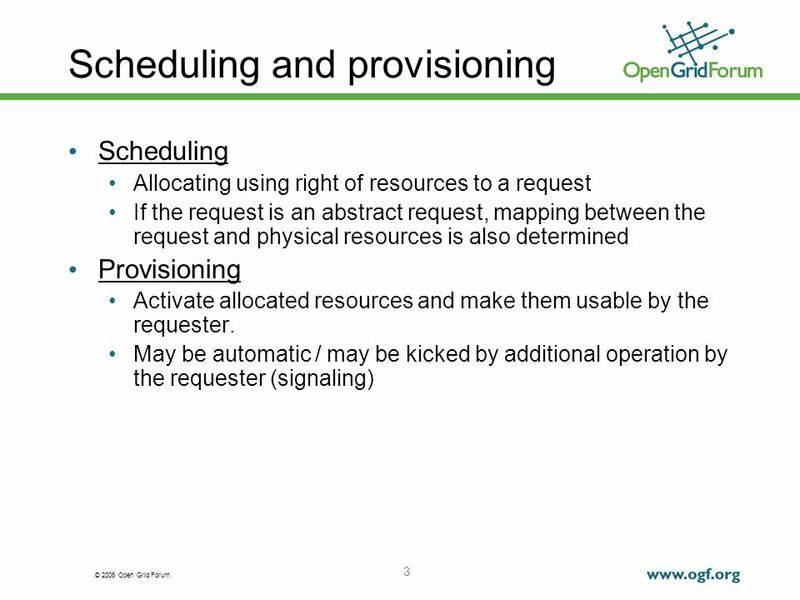 9 © 2006 Open Grid Forum 9 Priority and preemption If provision preemption is supported, both on-demand and advance reservation requests can be used simultaneously. 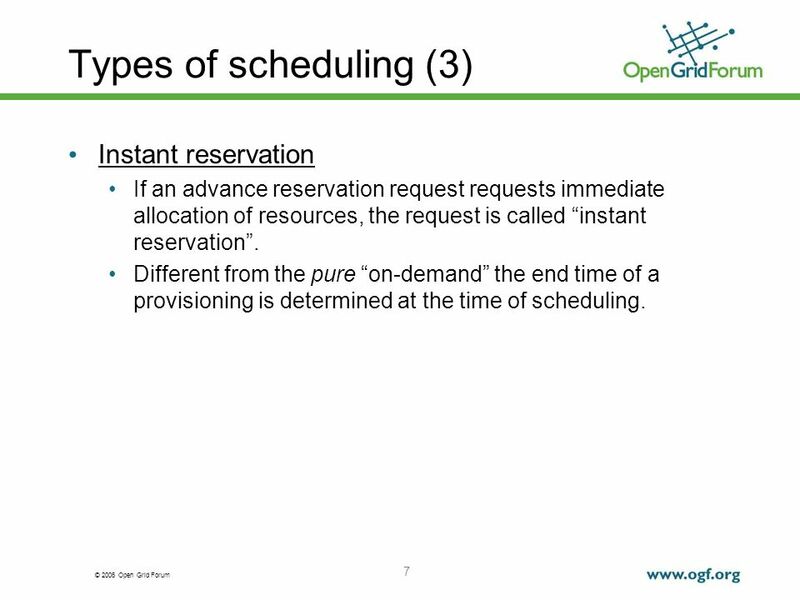 When the same resources are required, advance reservation requests with higher priority than existing (being provisioned) on-demand requests can be scheduled At the beginning of the reserved period of the advance reservation request, the resource is preempted (if the resource is still being used by the on-demand request) If schedule preemption is supported in an advance reservation system, re-scheduling may be done. After the re-scheduling, reserved period or other conditions of existing lower priority requests may be changed. A mechanism to let the clients of such existing requests know the change may be required. Download ppt "© 2006 Open Grid Forum Advanced reservation/Scheduling Tomohiro Kudoh (AIST, Japan)"
National Institute of Advanced Industrial Science and Technology Meta-scheduler based on advanced reservation Grid Technology Research Center, AIST Atsuko. RLS and DRS Roadmap Items Ann Chervenak Robert Schuler USC Information Sciences Institute. Lottery Method in BPA’s Simultaneous Submission Windows and Potential Application to the Simultaneous Defender Matching Process NAESB Meeting 05/01/13. 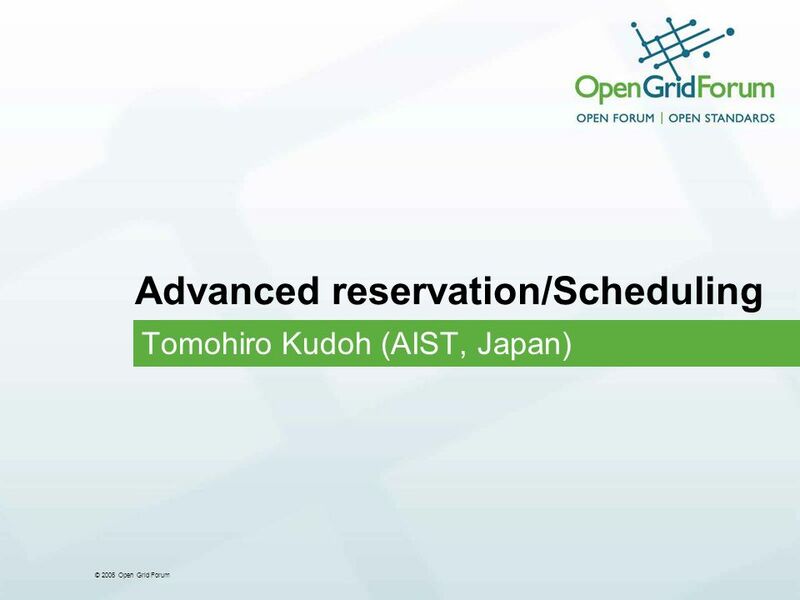 © 2010 Open Grid Forum Choices in Reservation operation 1PC/2PC, timing Tomohiro Kudoh, AIST. All rights reserved © 2005, Alcatel Grid services over IP Multimedia Subsystem  Antoine Pichot, Olivier Audouin, Alcatel  GridNets ’06. Introduction to Embedded Systems Resource Management - III Lecture 19. Tiers 1 & 3 Assignment Flat Profile Recommendation. © 2004, D. J. Foreman 1 Scheduling & Dispatching. © 2006 Open Grid Forum Network Service Interface in a Nut Shell GEC 19, Atlanta, GA Presenter: Chin Guok (ESnet) Contributors: Tomohiro Kudoh (AIST), John. © 2006 Cisco Systems, Inc. All rights reserved.QoS v2.2—5-1 Congestion Management Configuring LAN Congestion Management. Agreement-based Distributed Resource Management Alain Andrieux Karl Czajkowski.